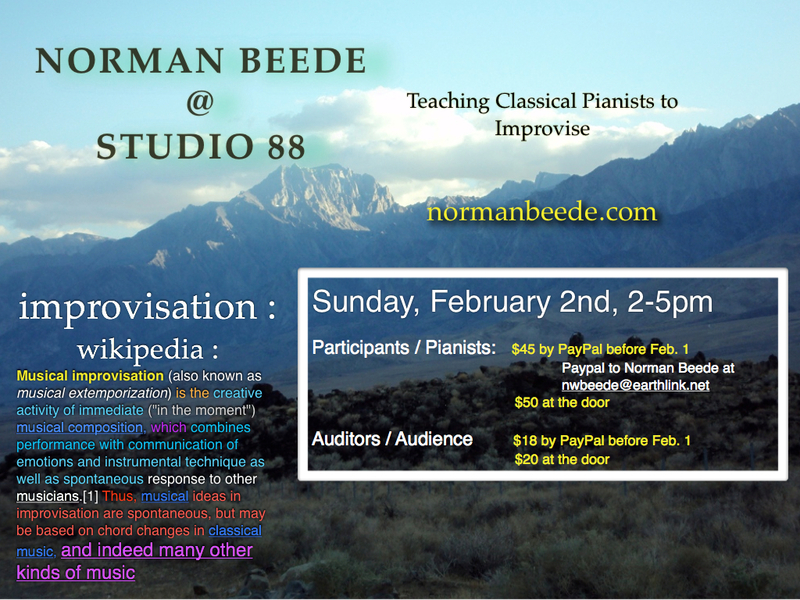 For all pianists, classical, jazz and pop, from intermediate to professional levels, interested in learning to improvise or to find new material for improvisation practice!! STUDIO88 is a wonderful new space in Aliso Viejo off of Aliso Creek Rd. near the 73 freeway-toll road with two grand pianos and plenty of space for workshops and intimate performances. This is the first of an ongoing improv workshop for pianists there once a month until the summer break. I would love to have you join us. Tell your friends! Each participant in the workshop will have one on one instruction and the opportunity to perform in an intimate space for fellow improvisors and others interested in the art of improvisation. Having two grand pianos in Studio88 means we will also be able to play duos and even “eight hand” as a group if inspired. We work as a group to encourage each other and to build on our skills as improvisors and to share awarenesses with the group. For more information please contact Norman Beede. Learn new and ancient ways of coaxing music of out thin air and ultimately making improvised music sound as if it were written. This is done with proven but generally ignored improvisation techniques that not only work, but are easy to learn and will continue to inspire creativity for the rest of your life. Materials: You will be given handouts. PDF’s of these handouts will be emailed to pre-registered participants to study before the workshop. Please bring a blank music notebook to class for taking notes.Who is this For: This workshop is for composers, songwriters, teachers, jazz musicians, and especially classical pianists wishing to break away from relying on the written page. Course Details: There are three sections to the class, each approximately an hour. I use the keyboard/piano as my teaching tool; however, all instruments are welcome. Preferably, for participation purposes the student has good keyboard skills or a strong desire to push forward with their keyboard knowledge. Each student will have the opportunity to play for the group, allowing for individual attention from me and feedback from fellow participants. Greek/Church Modes (1st hour): Demonstration of the correlation between thorough study of the Greek/Church modes and good, creative melody improvisation. I show the mode’s relationship to each other, grouped according to key and grouped according to root, graphing them from “light to dark.” This information often precipitates the most important breakthroughs for most participants. Cyclic Sequences (2nd hour): Study of cyclic sequences, starting with a beautiful sequence that flows thru all 24 major and minor keys. I cover tonicizing roots in any scale and introduce or re-introduce as the case may be, a chord progression that has been used extensively by 18th and 19th century classical composers as well as songwriters of the 20th century. Matchstick Harmony (3rd hour): Students will study how roots moving by thirds and fifths create well defined chord lattices manifesting an almost three dimensional improvisational landscape. In conclusion each participant has the opportunity to perform an improvisation based on some or all of the skills learned in the workshop and we discuss how the skills learned can enhance one’s ability to create improvisations, compositions, and jazz solos. Results: The students who take my workshops and study privately with me have gone on to build strong private teaching studios, some have careers as composers and performers. Even if you are a strong improviser already, the material covered in my workshop will broaden your scope and in the short and long term be worth more than you pay for it. Please see Testimonials for more information.